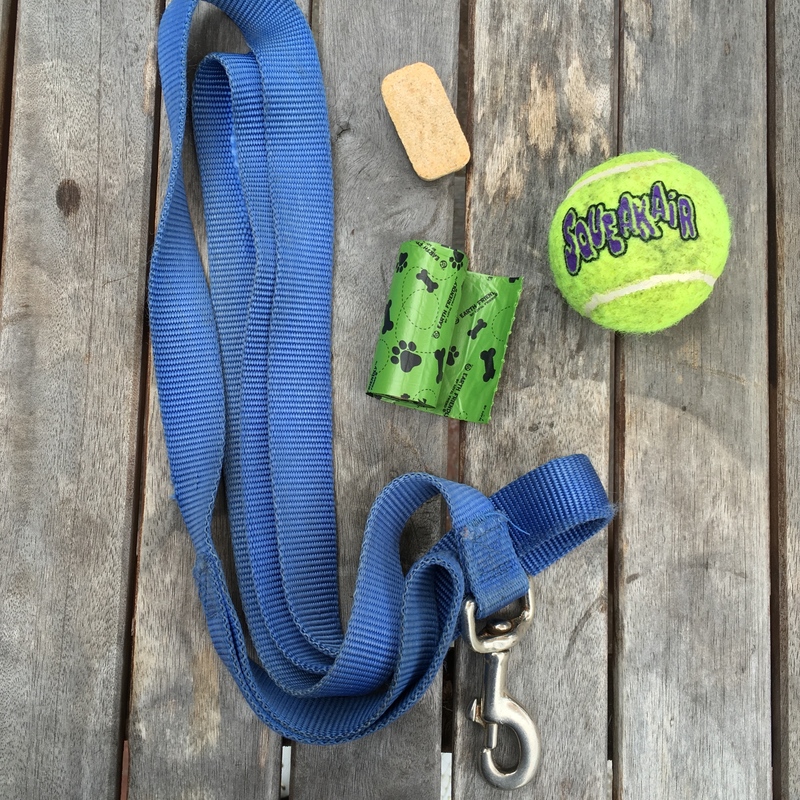 A few things a new dog owner needs. Not pictured: patience. As soon as we knew we were getting a house with a yard, Andy and I got a dog. Yes, even though it would be a month before escrow closed, we got the dog. We thought he was a mellow half-Great Dane, half-Labrador Retriever. Woofie would let us pick him up, he knew how to sit, and he wasn’t nearly as crazy as some of my childhood dogs. I took him out. He peed and pranced. We returned. Twenty more minutes passed. We went out again. And back in. Nineteen minutes later, the whining resumed. I continued packing silverware. Woofie whined louder. I ignored him. Woofie poked my thigh with his nose. Woofie backed up three feet. He gave a short, outraged bark. AND THEN HE PEED ON THE CARPET. RIGHT IN FRONT OF ME. WITHOUT SHAME. I spent the next twenty minutes cleaning the carpet. As soon as I finished, Woofie whined at me again. I hustled him outside. When he’d done his thing, I patted him on the head. He wagged his tail. Woofie whined at me a ton that first month. I was lucky if I could get a single box packed uninterrupted. But I didn’t dare NOT take him out, since the buyers for our townhouse might back out if the entire carpet smelled of urine. And I didn’t think it was fair to leave him in his crate all day. Escrow finally closed. Andy and I zipped over to our new house with paint, paintbrushes, and Woofie. We had one day to paint two rooms before our furniture arrived. As soon Andy changed the locks and I triaged various dying plants, we went to work. Woofie and his endlessly wagging tail we left in the backyard. We’d just gotten started on the primer when I glanced out the window to check on the dog. He’d been quiet. Too quiet. There was no sign of him in the yard. I followed Andy’s pointing finger. Something was wiggling outside. It was Woofie’s tail. And only his tail. 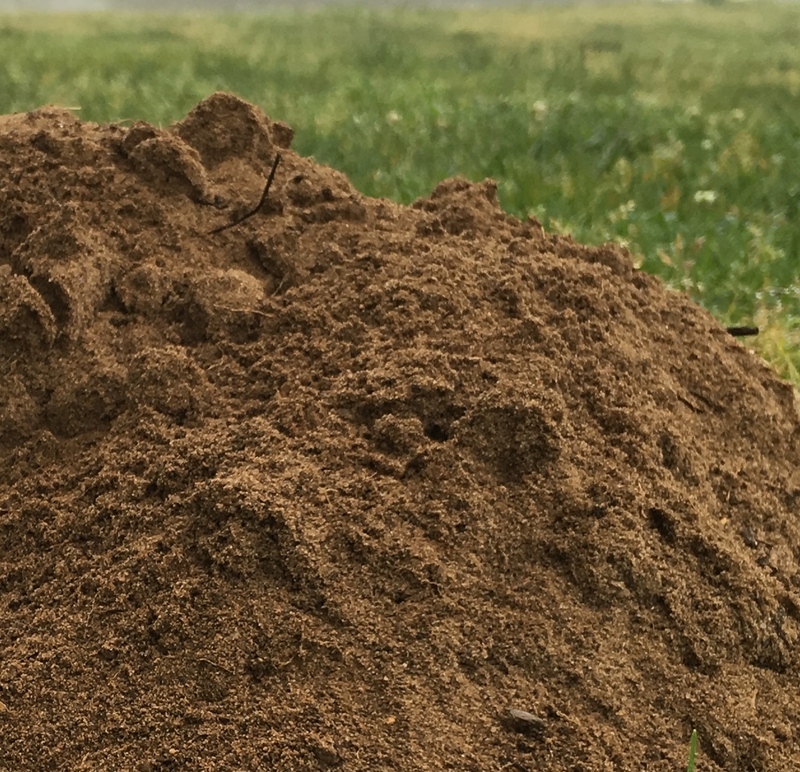 We ran outside and found the rest of him down a brand-new, three-foot hole, exuberantly flinging dirt in all directions. Of course Woofie’s hole wasn’t in the dog run area, or the dying vegetable garden next to the garage. Nor was it in the wilting flowerbeds lining the fence. 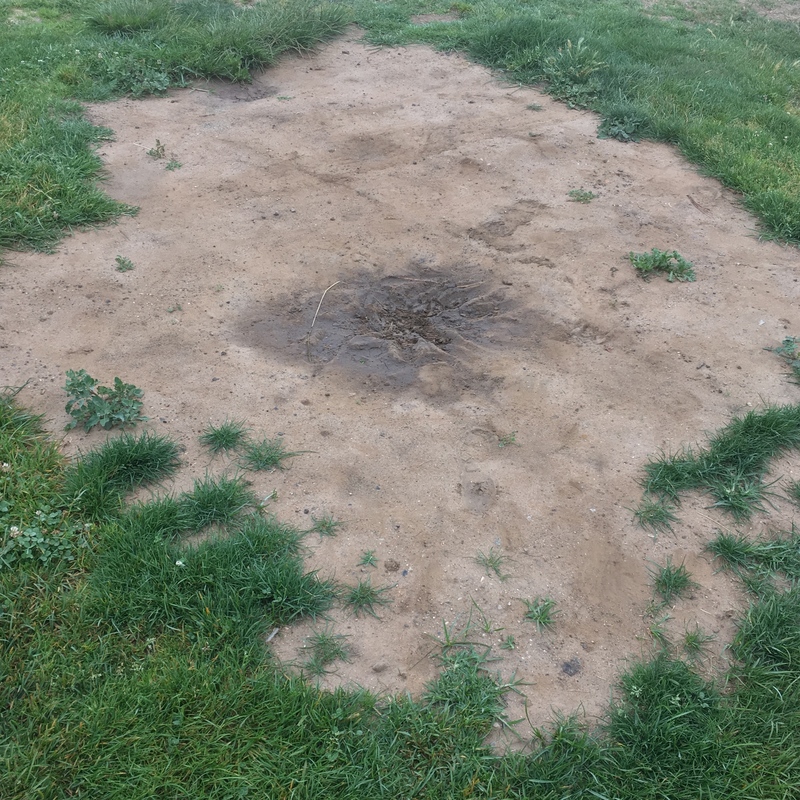 No, Woofie had decided that only the CENTER of the lawn would do for his excavation. The lawn had been the only almost-green vegetation left by the previous owners. We filled in the hole, replaced any chunks of sod we could find, watered it, and brought Woofie inside the house. I closed the doors to the rooms we were working on, and painting resumed. For five minutes. Then I heard the click of toenails, followed by a sigh and heavy breathing at the crack under the door. He sure has a tiny bladder! Or your 20 minutes is more like an hour! I bet there are more dog stories coming! I think that was the tail end of his puppyhood. Or he was just messing with me. It’s a good thing you bought a house with a high wall. An exuberant dog like Woofie could get into all kinds of trouble. Walls aren’t all bad. Even with the walls, I promise Woofie got into all kinds of trouble. I want to see pictures of Woofie! Nico sometimes pees 15 times during a 30 minute walk. I am pretty sure it is some kind of urinary tract infection but it usually disappears on its own. I think Woofie is just bored. Or marking territory. 🙂 I did put up his adoption photo on the “One Chance” post. It’s the best picture because someone took it with a good camera. Well, young Woofie is rarely seen solo in the pictures that weren’t lost. Which might give away our identities or part of the future story. Also, he photographs poorly because his fur is so dark. I need a really good camera! Growing up, I never had a pet. But my uncle had a dogs in Malaysia. Whenever one of them passed on due to illness or old age, he would get another one. They were not as energetic as Woofie and liked to laze around all day Except when my uncle turns on the house to clean the car or water the plants, they would come running for the water and shower. It’s hard to be energetic when it’s hot. I once tried to take Woofie for a walk around midday in the summer. He sat under a tree and refused to budge. I had to drag him home! Last time I ever tried to walk a big dog with a dark coat at high noon. I usually feel energetic when the weather is warm, but tell me to drag around something under the sun, no. That will leave me sweating buckets and that is never a comfortable feeling. Poor you. Ahhhh…dogs. I remember those days. The Dog Days of Summer, right?!! The end of your post makes me think that he started scratching the floor, so that he’d make more holes. xD Can’t wait for the next post! When I had to take care of my boyfriend’s dog, Seamus, this was many years ago, he pulled the same trick. Except it was in the middle of the night and he barked when he didn’t get his way. It was horrible. Eventually I put him outside, on the zip line, but all the did was bark and since I didn’t want the neighbors to hate me forever, I brought him back inside. Yeah, so, I think it’s attention, they want it. I’m sure if you googled it there will be a zillion advices on how to deal with it. GAH!!!!! Kongs filled with peanut butter. Nyla bones. I discovered an entire industry devoted to keeping your dog entertained (or at least from destroying the house). You are a good person for coping with Seamus and not letting your neighbors suffer. My neighbors are LAPD. They have an Australian shepherd and a German shepherd that they never walk. One of them barks every three seconds at night when the people are gone. Right outside our bedroom window. Given the vindictive nature of the LAPD, our options are limited. Aw, man. At least you’re in a safe neighborhood, right? Um. I haven’t gotten to those posts yet. I will say, though, that there’s a lot of ammo in that house. Which is disconcerting, especially when there is marital strife. Haha so do you let Woofie pee in the backyard now or no….?? I didn’t know dogs loved digging holes that much! Is it a dog thing or a Woofie thing? That’s the one thing about a dog… you have to walk them every morning and let them out to pee multiple times in the day. My previous supervisor got up at 5:00 AM every morning because her dog just HAD to pee at that time every morning. I don’t know if I could do it. Morning walks and evening walks are necessary, and for big dogs with dark coats, the earlier the better. I tried walking Woofie around noon once. He laid under a tree and refused to budge!